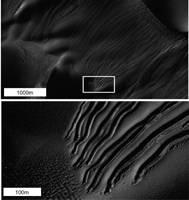 Several types of downhill flow features have been observed on Mars. 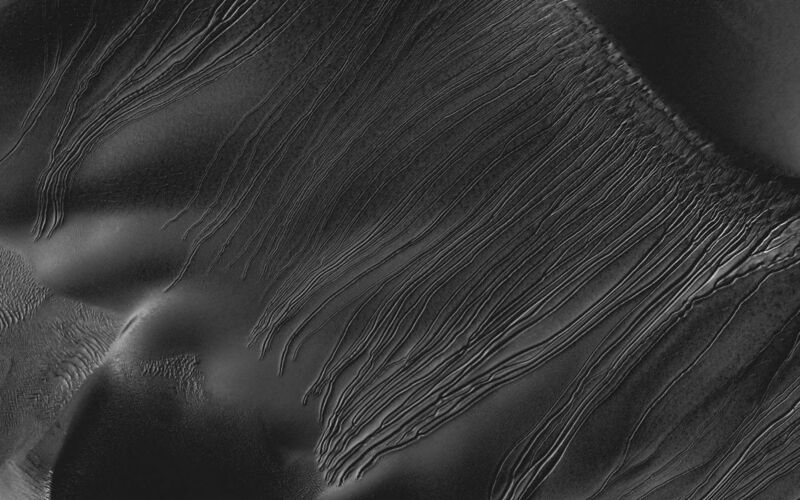 This image from the High Resolution Imaging Science Experiment (HiRISE) camera on NASA's Mars Reconnaissance Orbiter is an example of a type called "linear gullies." Linear gullies are characterized by relatively constant width and by raised banks or levees along the sides. 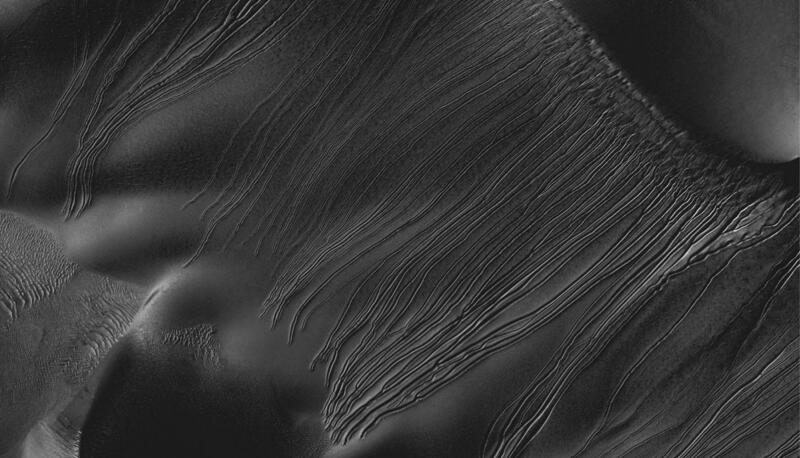 Unlike gullies caused by water-lubricated flows on Earth and possibly on Mars, they don't have aprons of debris at the downhill end of the channel. 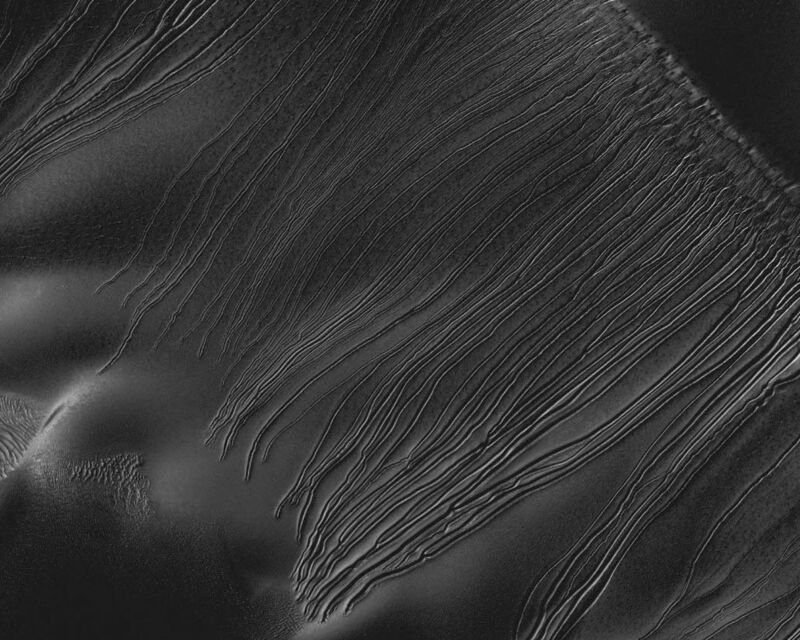 The grooves shown here, on the side of a large sand dune inside Russell Crater, are the longest linear gullies known, extending almost 1.2 miles (2 kilometers) down this dune slope. New research points to chunks of frozen carbon dioxide, commonly called "dry ice," creating linear gullies by gliding down sandy slopes on cushions of carbon-dioxide gas sublimating from the dry ice. 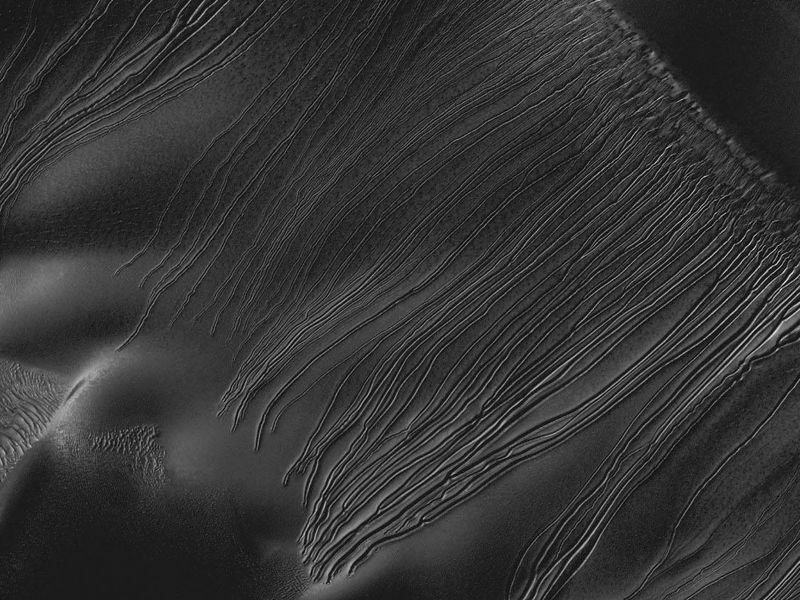 Linear gullies are on mid-latitude sandy slopes, where the ground is covered with carbon-dioxide frost in Martian winter. Before-and-after pairs of HiRISE images indicate that the linear gullies are formed during early spring. Some linear gullies -- such as the ones in the magnified section of this image shown as Figure 1 -- have pits at the downhill end that could be caused by a block of dry ice ending its slide and resting in place as it sublimates away. This image is a portion of the HiRISE exposure catalogued as PSP_001440_1255 taken on Nov. 16, 2006, at 54.25 degrees south latitude, 12.92 degrees east longitude. The University of Arizona Lunar and Planetary Laboratory operates HiRISE, which was built by Ball Aerospace & Technologies Corp., Boulder, Colo. NASA's Jet Propulsion Laboratory, a division of the California Institute of Technology in Pasadena, manages the Mars Reconnaissance Orbiter for NASA's Science Mission Directorate in Washington. Lockheed Martin Space Systems, Denver, built the orbiter.